Yes or No: Is Cheerleading a Sport? After all, the cheerleading at football or basketball games, while often impressive, exists as warm-up acts for the crowd, don't they? They're just a way of getting the fans excited. You know, to get them into the actual game. Surely that can't really count as a sport, right? Of course, if you ask a cheerleader this question, you will most likely encounter a very different response. So just to get a little bit of an idea what we say when we're talking about cheerleading, we do a little digging. What is modern cheerleading? Is it any more challenging than pom-poms and the occasional awkward chant? If you were to do a search on cheerleading as it's currently practiced, you would see athleticism. Strength, balance, speed. Plenty of teamwork. All are happening simultaneously, in a competitive environment. Yeah… perhaps the question is not as open and shut as many people assume. The argument is somewhat complicated by confusion about what the point of cheerleading is. The answer to that is: which kind of cheerleading are we talking about? The average person on the street may be totally oblivious to the fact that there are really two main types of cheerleading that are commonly practiced and offered as school programs. First, there's sideline cheerleading. This is what accompanies high school or college football and basketball games. A team comes out during halftime and entertains the crowd. Sideline cheerleading is what most people think of, right off the top of their heads. A few spirited cheers, some songs, and some acrobatics in support of the local basketball or football team. All in good fun. While it's impressive, it is, by definition, a sideline act. And this is why many people dismiss it. All Star cheerleading, however, is not a supporting event. All Star teams spend hours in the gym, practicing specific moves and two-and-a-half minute routines, all for the purpose of competing against other teams. While sideline cheerleaders spend significant time practicing their routines as well, in the case of All Star cheerleading, it's a little different. The entire goal of an All Star team is to compete. They practice so that they can first place in competitions. So while the best sideline teams are very, very good, and can often compete in events, their primary purpose is typically considered to be to represent their school, community, and the local athletic teams. All Star groups don't have that goal in mind. And that means they can't be dismissed as a warm-up act, and discounted on those grounds. You Afraid of a Little Competition? But All Star teams do face a major hurdle. This is a comparatively young sport. They are still fighting for recognition, as they are still a relatively new development. All Star cheer only really got off the ground in the 1980s, and the first competitive cheerleaders operated without much by way of publicity or support. Eventually, the USASF (the United States All Star Federation) was created to help nurture and develop All Star's competitive structure. Still, the USASF has only been around since 2003, and that's not a very long time to help their cause gain a significant amount of respect. 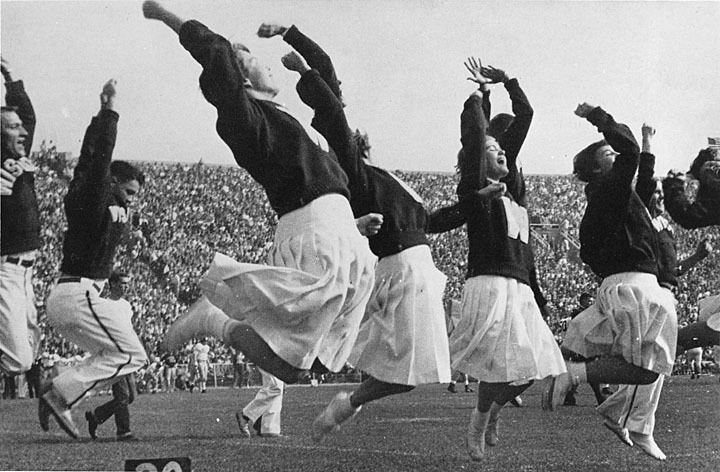 Sideline cheerleading, meanwhile, has existed since the late 1800s. That means there's over a century of conditioning to think of this cheerleading thing as only being an “add-on” feature to another sport. The USASF is obviously attempting to re-write the narrative. Despite being relatively new, they have managed to set up a competitive structure, with standardized judging and they have managed to get the attention of the Olympics. The USASF was initially created for a few reasons. Partly, it was out of a desire for greater respect for cheer as a sport, also for added visibility. From an administrative standpoint, the USASF filled a glaring need: improved oversight and added safety for an athletic exercise that causes no small number of injuries in any given year. The relatively young status of competitive cheer puts it at a disadvantage for widespread recognition. But that hasn't stopped it from becoming popular. The USASF's premier event, the World Cheerleading Championships (or “Cheerleading Worlds”) have been held annually in Orlando, Florida since 2004. Another obvious hurdle is long-lasting gender stereotypes. Cheerleading today is a female-dominated sport, with some 97% of participants being girls or women. Male cheerleaders are rare, the result of social pressure and expectations. It probably comes as no surprise that female-centered activities have a greater challenge getting support and funds from athletic development institutions. Now the USASF is looking to bring competitive cheer into a new era. There are many who believe it should be recognized as a sport, and many who are pushing for its inclusion in the Olympic Games. The growing popularity isn't just confined to the United States. Competitive cheer became a hit all over the world, perhaps best exemplified in this bit from “Britain's Got Talent,” where the Coventry Dynamite Cheerleaders brought the crowd (and the judges) to their feet. Okay, so Simon Cowell stayed seated. But come on, that's Simon. He still voted yes. That's like a standing ovation from anyone else. Bit by bit, showcases like this go a long way toward bringing about a change in the conversation. There is no football or basketball team anywhere in the picture here. No mascots, no halftime break. And it's like this at Cheerleading Worlds. The cheer teams are the main event. So why hasn't it been more widely accepted? A physical activity which involves propelling a mass through space or overcoming the resistance of mass. A contest or competition against or with an opponent. Is governed by rules that explicitly define the time, space, and purpose of the contest and the conditions under which a winner is declared. The acknowledged primary purpose of the competition is a comparison of the relative skills of the participants. So here we have the issue right in front of us. Cheerleading does each of these. A contest or competition. All Star cheerleading has that locked down. Governed by rules… yes, there are regulations surrounding the format of All Star competition. Routines must be a certain length; the area on which they can take place are the same for everyone. And the purpose of the competition is a test of skill. So there you have it — open and shut case. When someone asks “is cheerleading a sport?” they should probably not get too far into the discussion if they haven't first checked out footage of some of the most advanced stunting. Stunting is competitive cheer's way of saying what the rest of us would probably refer to as “all those fancy flips.” It's the show-stopping, breathtaking, and often dangerous acrobatic element that makes the exercise fun to watch. It also requires skill. And practice. The stunt can't be done with just one person. To get the loft necessary for an athlete to execute a stunt, you need a team of people who can both provide a boost… and a safe place to land. A stunt team often has four members. The flyer, who goes up in the air, (flips, kicks, whatever the particular stunt requires). Then you have the three members who stay on the ground: two bases and a back. Different stunts can use more complicated configurations, but the primary goal is the same: execute the routine, and make sure the flyer stays safe. Often a jump will include the entire team. In this case, form and consistency are most valued. The judges look at timing, but they also look at certain aspects. The height of the jump. Pointed toes, straight legs. And this introduces another common talking point that we'll get to shortly. These sorts of skills are similar to other internationally acclaimed and respected sports. Gymnastics. Figure Skating. Trampoline. If these are worthy of the Olympics, why the stigma against competitive cheer? Starting in 2004, just as the USASF was getting off the ground, the top athletes in competitive cheerleading were offered something that had previously not existed: a major championship with media coverage. The Cheerleading Worlds, which has since expanded to become the Cheer and Dance Worlds, invites some 11,000 cheer and 4,000 dance athletes every single year to Walt Disney World in Orlando, Florida. Working with ESPN, a true national contest was established. The best cheerleaders in the country gather here (to compete, the teams need to be considered level 5 or 6, the highest levels possible). This is something that has helped establish the idea of competitive cheer as a sport more in recent years. At least, there exists a truly competitive arena in which to pit skill against skill. However, all this competition is not without risk. The reasons for this aren't entirely positive. The AMA had simply been dealing with a problem that had been flying under the radar for too long. The American Medical Association was backed up by the American Academy of Pediatrics. The AAP conducted a study that showed that cheerleading accounted for 66% of all the catastrophic injuries among high school girls over the prior 25 years. They realized that the tumbling and constant exposure to risk meant that there was an increased likelihood of injury, especially since there was often minimal training in injury prevention for coaches. And there are any number of potential mishaps that could happen. Sometimes it could be a bad fall that results in a pulled muscle or a strain; other times it could be repetitive stress injury. The fact that many cheer athletes are launched high distances into the air also means that there isn't just one type of injury that can occur. Pretty much everything is at risk, and All Star cheer poses dangers to the spine, back, ankle, wrist, neck, elbow, and knees. The risks for repeated stress injury are particularly worrisome. Teams will often practice at least 15 hours a week; a huge time commitment for a high schooler with a busy schedule of classes and other extracurriculars. That's a lot of opportunity for problems to crop up. Viewed in this light, the push to get cheerleading recognized as a sport becomes even more understandable. With this classification comes better oversight, better training for coaches, and better resources for helping anyone who might be hurt (as there are for other sports that have been recognized). Official sports have to have more regulatory oversight in order to prevent injury, something that cheerleading wasn't required to receive before the reports. Thankfully, due partly to the efforts of the AMA and the AAP, more schools are taking greater precautions and training staff better. If you really want to answer the question “is cheerleading a sport?” you can take a look at the score sheet, and see what they're being judged on. The scoring system can be pretty confusing at first. In fact, one of the challenges has been making sure the judges are consistent. This is to be expected with the first rounds of any sport that's still growing. It has led to an increased emphasis on accuracy and training. Scoring generally breaks down into the judge's opinions of several basic elements. In a routine, an All Star team can score a maximum of 100 points (this number is lowered for certain lower levels, which cap the difficult stunts or leave them out entirely). In a standard competition with a Varsity scoring system, the minimum a team could get is actually 75.5 points. Teams can actually lift this baseline score into the 80s by making sure that they attempt stunts, jumps, and pyramids with a higher degree of difficulty. If a team only executes the easiest moves, they won't score as high, even if they do a good job. The difficulty of the routine and the creativity will affect the overall score, but only by a few points each. By far the largest factors are the athletes' technique and deductions. Good technique can instantly bump you from the mid-80s to the mid-90s on a score sheet. But the thing that can hurt you are the deductions. Deductions in a competitive cheerleading routine would come from a few places. There are deductions against the individual and deductions against the team as a whole. Individual deductions might be that an athlete fell, or that an athlete stepped out of bounds during the routine. Larger deductions might come from a building fall. This would be if the group is attempting to lift one of their members off the ground. If the structure collapses, this will be very noticeable in the routine and will cost the team more than a deduction against an individual athlete. And finally, there are other violations that can be counted. The routines all need to be timed, so going over the time limit is another way that a team can lose points and give ground to their competition. Typically, a routine might be in the 2-minute to 2.5-minute range. There's a bit of variation, depending on the age and skill of the athletes. But most routines don't last much longer than this. There are also ways an athlete can lose the team points (for unsportsmanlike behavior, for instance). Arguing with judges, with other athletes, rude gestures, or inappropriate comments can all result in loss of points. Is Cheerleading a Sport? Or is Gymnastics Not One? Gymnastics comes to mind for a few reasons. First of all, it's popular, so you don't have to think too hard before it pops into your head as being similar to cheerleading. Second, it is routinely followed and one of the most beloved events of any Olympic sport. Although gymnastics is certainly impressive, with competitors performing elaborate moves on specialized equipment, the reality is that cheerleading teams use many of the same underlying skills. The major difference is that cheerleading is done with the help of teammates, rather than a beam or bars. And this is probably one of the biggest cases for competitive cheerleading to be incorporated into the Olympics. If it doesn't fulfill the basic requirements necessary, then why should gymnastics be allowed in, to begin with? Yet some people still think it shouldn't count. If you ask them “is cheerleading a sport?” they'd probably just roll their eyes, annoyed that you even asked the question. So what are the reasons for this intense anti-cheer? Well, we're pretty sure we know one reason. There's the obvious: cheerleading is a sport that for the last several decades has been almost entirely comprised of female athletes. Not only that, but the aesthetic is decidedly a feminine one. Because of this, the actual skill involved in executing the components of the sport are given less credit than they deserve. There is also a good deal of cultural bias against cheerleaders. The cheerleader in American casual conversation is often made to be synonymous with someone who is vapid or superficial. That's not a fair assumption, but even if it *were* fair… how is it different from the “dumb jock” stereotype? And yet football is considered a sport. Of course, it is. Suggesting otherwise is a ridiculous position to take. But the refrain still seems to come back to the idea that because cheerleading exists to be entertainment before another event, it can't count. Even if it has evolved into a competitive sport in its own right, the fact that this is part of its origin somehow compromises its validity. If you're seeing a rock concert, there's a good chance that before the headliner comes on, there's going to be at least one smaller band that opens for them. If the headliners are a really big act, the opening band may even be pretty well established in its own right. The same holds true of comedy shows. A star comedian will often come on after a warm-up act. And yet… would anyone really suggest that a stand-up comedian stops being one if he decides to warm up the crowd by telling a few jokes before the main act starts? Does a band stop being a band because it opens for another one? Of course not. What they are doing intrinsically is what matters. At the heart of cheerleading is still a defiant attitude. Despite the haters, the sport's governing body (the International Cheer Union, or ICU) has joined others who believe in their cause and has successfully pushed to get the Olympics to take notice. At the end of 2016, the International Olympic Committee recognized Cheerleading with what's known as a “provisional” sport. This means that they aren't officially a part of the Olympic Games yet, but it is largely seen as a stepping stone to competing on the big stage. If the IOC says, it's a sport, who are we to argue? Lastly, although it's not a technical argument, one of the greatest cases you can make for a sport is this: in the midst of competition, does this also encourage the moments of humanity that we encounter in athletic sports? We know those moments. When a marathon runner helps another over the finish line, or when an injured softball player is carried around the bases. There are moments in competition where players do right by one another. During the 2016 NCA All Star National Championship, there was just one of those moments. The Cheer Extreme Cougars, a team from Raleigh, NC took to the mat with a strong opening, drawing cheers from the crowd. Their routine gained steam, and then, just as they were preparing to execute one of their main stunts for the routine… the music went completely silent. No music. Two full minutes of routine left to go. This is one of those nightmare scenarios. Fans, coaches, parents, and opposing teams… many of whom are hoping to place higher than the Cougars, all helping them stay on track, willing them to finish strong. To be their best. The Cougars did finish their routine, and they went on to win that year's competition. The video of their stunning performance has collected millions of views since then. There's no denying that this is sportsmanship. And no denying that it is indeed a sport.